Today's conglomeration is the reverse of last Thursday's. 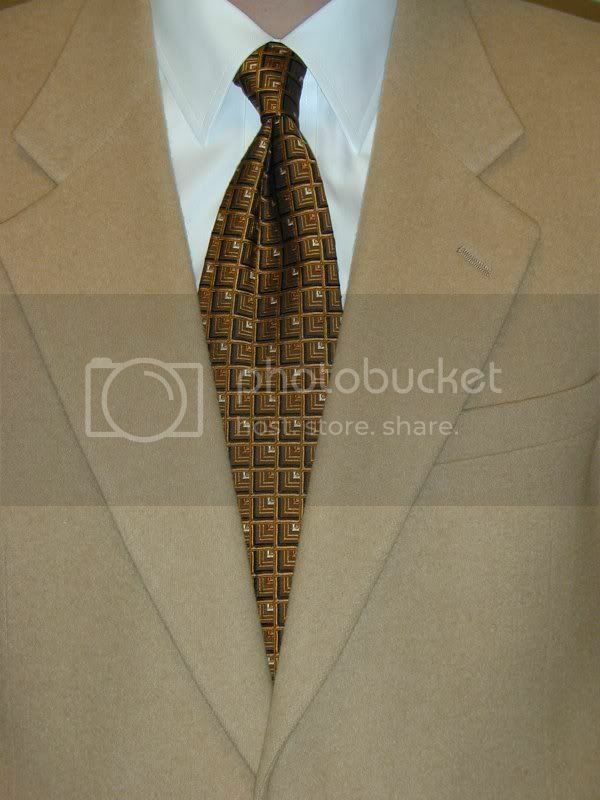 The sportcoat is the tan colored camelhair. This time I wore a white, spread collar pinpoint oxford. The necktie is also a Ferrell Reed City of London. It has a gold background with different shades of gold and some black. Four-in-hand knot again. I tried a Pratt and half Windsor but the knot would not cooperate. I even had difficulty knotting the four-in-hand. I think I may get rid of this necktie just so I don't have to go through that again. The black portion of the conglomeration is the trousers. Comments? Suggestions? Is there anyone reading this? Just curious. Are you laughing your hineys off at the goofball that documents his daily conglomerations? Really, I just do it to keep track of what I've worn so I don't wear the same thing two days in a row.